While I doubt the city will ever use “Gateway to Awesome” as its official slogan, Flagstaff, Arizona really is a gateway to so many awesome adventures. For starters, Flagstaff has Sedona and its vortexes to the south, the Grand Canyon to the northwest, the immense Navajo Indian reservation to the east, millions of acres of national forest surrounding town, Arizona’s highest peak in its backyard, and a rockin’ year-round outdoorsy vibe. Oh, and it snows in Flagstaff. Sometimes by the foot. In Arizona. Weird, right? Out-of-towners never believe it, choosing instead to say things like “Snow!? Yeah right, buddy! Not with all that ridiculous Arizona heat!” Believe it, though! With all that public land nearby, hiking is a no-brainer. The trail selection is seemingly endless, and probably too long to mention here. So I suggest you start with Richard and Sherry Mangum’s “Flagstaff Hikes,” where you’ll find 146 day hikes to choose from. Be sure you hike the San Francisco Peaks at least once. 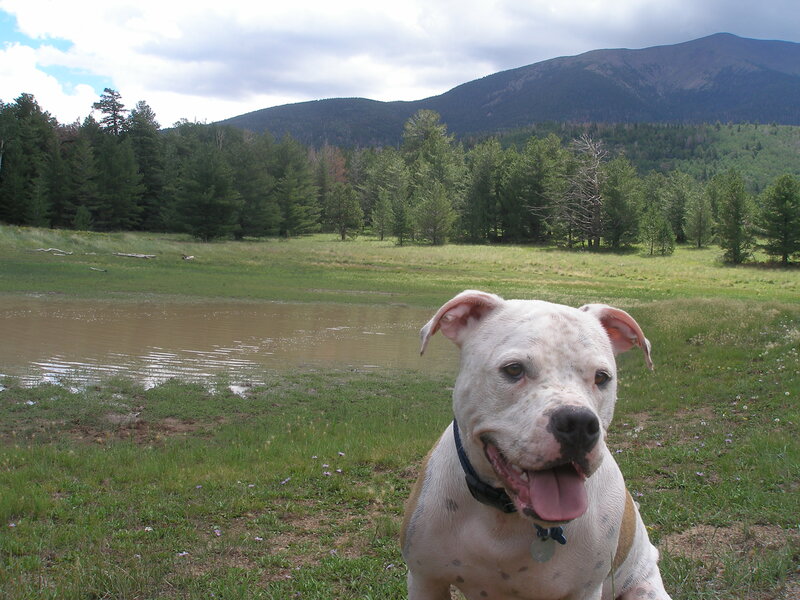 Hiking in Flagstaff with my dog Cyrus, with the San Francisco Peaks in the background. Always wanted to check out a cave but never had the skills/gear for serious spelunking? You’re in luck. The Lava River Cave is an easily accessible lava tube that offers adventurous fun for the whole family. The only minor challenge is having to duck as you enter the cave down a natural stairway. Other than that, you can stand upright as you explore the length of the cave (about .75 miles one way). Bring flashlights and warm clothes. It’s dark and cold down there. One of the best places to unwind in town is Beaver Street Brewery. Their beer is great (try the R & R Stout), and the food is better than what you’d expect from a brewery. If you’re of age, head over to Beaver Street Brews & Cues, the brewery’s billiard room next door. After you’ve played enough pool, hang out in the lounge, where you can demolish your opponents in a friendly game of Wii bowling while sucking down tasty Beaver Street brews. The mountain biking scene is huge in Flagstaff, and for good reason. Folks in Flag have access to so many seriously fun (and steep!) singletrack trails, it’s almost unfair. Beginner and intermediate riders should check out the Soliders Trail in Fort Tuthill County Park. The more advanced rider will find plenty of bliss out on the Fort Valley Trail System. No bike? No problem. Call one of the friendly bike shops in town for a rental. Snowbowl is no Snowbird, but come on, you know you want to say you’ve been snowboarding in Arizona. There’s a fun, laid back local vibe on the mountain, but when it dumps, you better be ready because those fresh powder lines won’t last long. Arizona is canyon country, the grandest of them being just a short drive from Flagstaff. But if it’s total solitude you’re after, check out Sycamore Canyon. Just getting to a few of the canyon’s trailheads is an adventure itself. The hike in is beautiful, and it’s so quiet down there, it’s almost eerie. If you’re into history, you’ll love Wupatki National Monument and Walnut Canyon. Both sites are close to Flagstaff and feature ancient Native American ruins. Don’t miss the ball court and geological blowhole at the Wupatki Ruin. Have you been to Flagstaff? Share your experience in the comments section! I’ve never been to Flagstaff but you may have just sold me!!! Nice post. I think you should work for the Flagstaff division of tourism. They’d LOVE you! Yes, you would be great at writing travel brochures! You make everything sound like an excitng adventure. Explore a secluded canyon – that sounds amazing to me! I always thought it’d be cool to write for Lonely Planet. Sycamore Canyon is incredible! It’s so easy to find solitude there. Nope, I haven’t been….YET! The caving sounds awesome. It’s super cool! It feels like you’re in a subway tunnel or something. You’ve made Flagstaff sound like a perfect spot for an adventure trip! All kinds of fun to be had in Flag! Last summer, my sister and niece took a road trip back to Texas from California after my niece spent a summer there. They stopped many places, but Flagstaff was one of their favorites. I’ll have to put that one on my list! If you love camping, you would love Flagstaff! Let me know if you head that way so I can share a few of my favorite camping spots with you.